I had the pleasure of attending a family engagement lunch on Saturday and I had to find an outfit that was both casual and stylish. It was also absolutely freezing so any skirts or dresses were out of the question and I couldn’t bear wearing my everyday winter coat. (Don’t be fooled by the sun shining,it was FREEZING!) 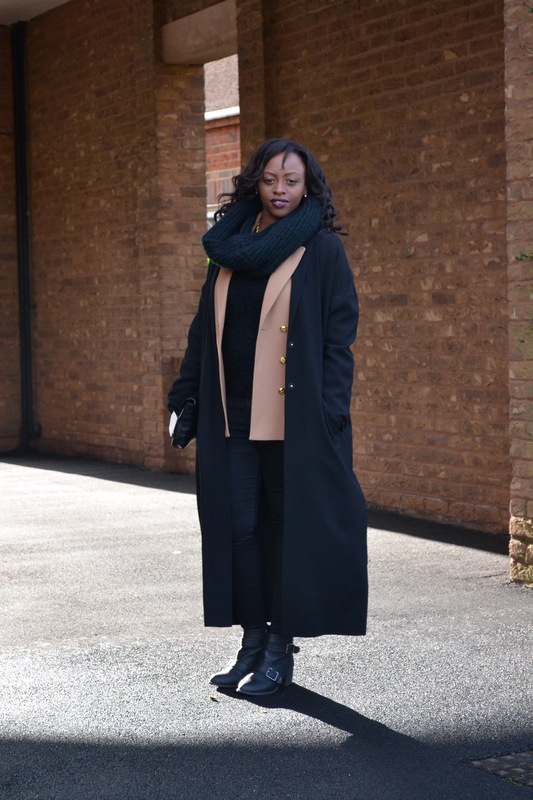 So I decided to go for a layered look as I wanted to wear my duster coat but it’s definitely not meant for winter. I went for items I have in my wardrobe and the only new item was my clutch bag which I am absolutely in love with! Be assured I will carry it everywhere as I needed it. My old one is super worn out! I would highly recommend that every woman should get a duster coat for all those days where you can’t be bothered to dress up or even if you are. This coat totally updates your look instantly and the same goes for a camel coat. Whatever size you get, be it long or short, you will be bang on trend this season with one of these bad boys! I also would recommend the Mango clutch as it is currently on sale for £14.99… BARGAIN!!! I took these pictures just before I left the house so pardon the goofing around! Wishing you all a lovely,productive and blessed week! Disclaimer: All photos are my own unless stated otherwise.These were taken by my photo buddy TS.